Gone are the days of your techs spending time building uni-strut structures to hold a couple of conduits over a rack to feed cable down from the plenum space. 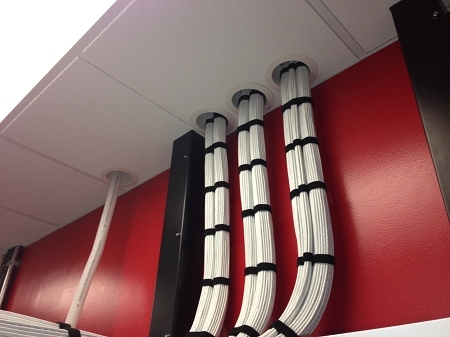 The CTS Suspended Ceiling Cable Penetration System holds a 4" conduit in place and sits above a ceiling tile so you can easily and discreetly hold up to 3 conduits in a 2' x 2' ceiling tile. Our assembly will save your company time, money and resources! Tube can be moved to any of six locations placing it in the exact location you need above you rack. Zinc plated Steel is strong and slides to further accommodate the perfect location. Assembly is supported by both the ceiling grid as well as four grid wire anchor locations. Tube assembly is made from V0 rated materials! 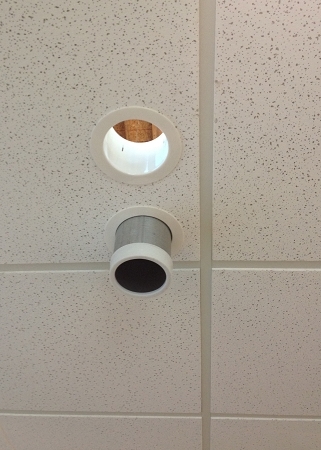 Insert a 4" ridged conduit into the locking sleeve or use the sleeve as your pass though in the ceiling tile. Copyright Cable Tech Solutions. All Rights Reserved.